Discussion in 'Cases & Case Modding' started by Astrowind, Feb 8, 2019. I've used several different cases in my life for builds but this is probably the first time I'm satisfied (without modifying it). I ordered the Antec GX202 mid-tower computer case and received it today. Even if I haven't used it yet, I decided to buy it even though my next build may be next year. The last times I've seen things I wanted to buy in the style I liked, the items sometimes were no longer available by the time I thought about buying them. Let me help. Not bad looking at all for a $50 case. I like that it has a 5.25 bay for optical, those are almost extinct but I still use them. Even Antec's budget stuff is pretty good. Dust filter on bottom for power supply intake is always welcome. And I assume the entire front mesh part acts as a dust screen since there isn't another one under it I can tell. Oh that pic didn't have the LED fans on. Just white, no LED. I kind of like that. I also like the mesh front instead of the new trend of putting solid acrylic or glass in the front which murders airflow at the cost of looks. Oh, I see a chink in the armor. Not that surprising since it's a budget case, but the hard drive mounts are faced inline, and doesn't have modular/removable bays to remove ones you don't use. So 2002. 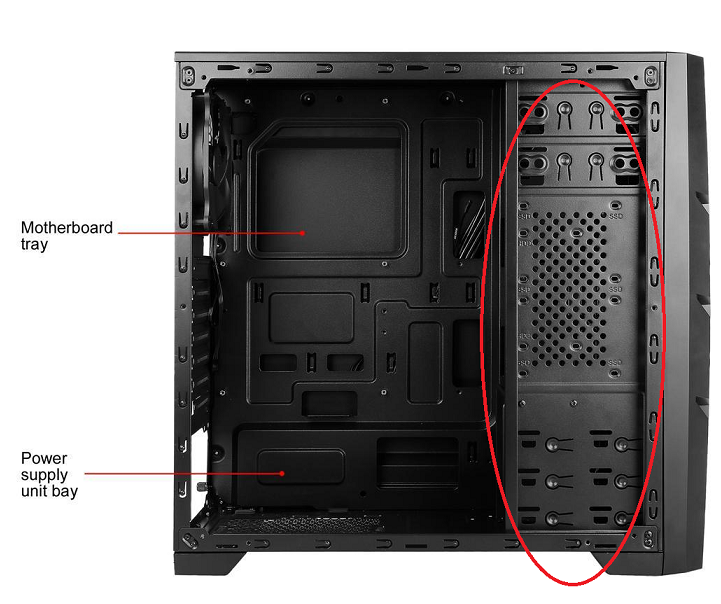 Every case now should have hard drive bays that are sideways mounted facing out, for easy install/extraction. With a huge inline bay, you can get blocked off by motherboard/video card, etc. My Antec 300 is like that and it's a ROYAL pain to install or remove hard drives with motherboard installed. I guess if you only have 1 drive it's not a huge deal. Those SSD mounts are weird. There are 2 on each side and it looks like they mount inside the inline bay, but vertically for a total of 4. Then again, with M.2 SSD becoming more popular, drive bays are getting less necessary all the time. I would have loved if they had just put 2 x 3.5 and 2 x 2.5 near the top below the 5.25 bay, then just chopped the rest off. But I guess that is what dremels are for. OTOH the drive bay probably has a lot to do with case stability/rigidity since it's a budget box. Cutting it out might make it wobble (-er?) ? Sorry I hijacked OP's thread, LOL. I got all excited about a decent new budget case. I didn't really think about the fact side drive bays would make it easier to take them out later but usually, I don't replace drives.